The Advanced level is divided into two sections. The first part helps your students with more complex grammar points. The second part takes grammar beyond the sentence and looks at grammar for reading, writing and speaking. 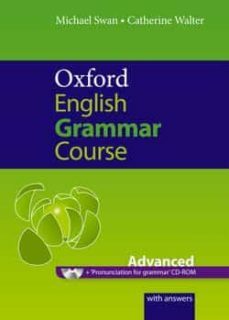 • Short, clear grammar explanations are easy to remember • Real examples show how the grammar works in practice • Engaging practice activities including Internet exercises, Grammar in a text and Grammar and Vocabulary • Colour illustrations and cartoons put grammar in context • Grammar for reading, writing and speaking • Pronunciation for grammar CD-ROM helps students hear how grammar sounds Each section opens with a lively presentation page which introduces the point of grammar. The grammar explanations are short, concise and easy to remember. Each grammar point that students learn is followed by an activity so they can practice before moving on to the next explanation. The practice activities are really engaging. 'Check your knowledge' exercises revise basic grammar and are combined with vocabulary work. 'Internet exercises' encourage students to do their own exploration of usage. Part 2, Grammar for reading, writing, and speaking helps your students with the production and understanding of more complex spoken exchanges and written texts at different levels of formality. Towards the end of the Advanced level students will be at a level where they will benefit from using Practical English Usage and Practical English Usage Diagnostic Tests.